MAmp is a great sounding vintage amp. 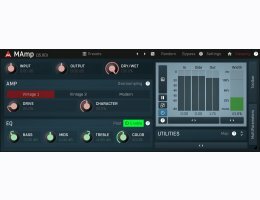 Whether you are looking for a soft saturation to enhance the harmonic content or a great sounding creative distortion, MAmp is the perfect tool for the job. MAmp employs the famous distortion algorithm from MVintageRotary, which is inspired by the vintage analog components, but is not limited that way. Courtesy of digital processing! Plugivery is an official distributor for all MeldaProduction's products.